My Cubed Flowers series of bracelets started life as this straight piece of beadwork made using triangle weave. 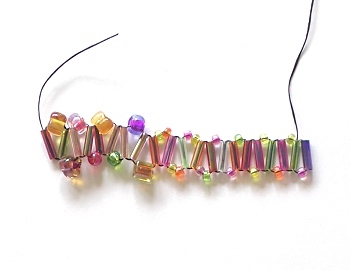 As I beaded along the row I began adding different sized and shaped beads and saw how they distorted the straight line, which gave me the idea of using larger beads to purposely curve the piece. You can see the result in the next sample.